Usage: For protecting goods from falling off pallets. Special formulation of color and chemical allows us to produce gold colored rubber bands which are nothing less in shine than the real thing. They are 100 % pure and 100% transparent. The strength of these bands is the greatest that can be achieved. Geetanjali Exports one of the renowned organizations in the industry, we are highly engaged in providing a premium quality range of Rubber Bands. 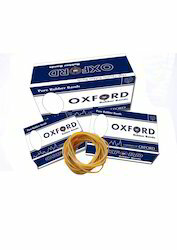 Owing to our enriched industrial experiences, we are devoted towards manufacturing a wide variety of excellent quality Rubber Band. 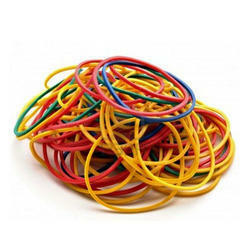 Rubber Bands are available in different colours and sizes as per customer's requirements. price is very affordable and at unbeatable pricing. We are the largest manufacturer in all over India . Design: Size 1" ,1.5", 2", 3"
Our expertise lies in providing our customers a highly effective assortment of Flag Rubber Band. This product is designed & manufactured by our skilled experts, under our manufacturing unit and as per the pre-defined quality parameters. Moreover, we offer complete range at industrial leading prices. A funky look with this cute bunchy pony. Made from Medical grade Natural Latex and Biocompatible ingredients. This is made from fine quality latex. It's our trending product and can be used as fluorescent poly. Being a leader in the industry, we are engaged in offering a qualitative range of Industrial Packaging Rubber Band to our clients.